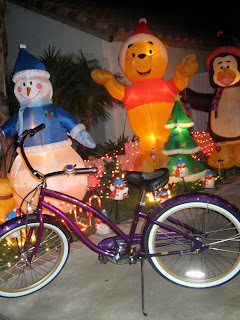 Cheerful Events: Santa brought me a bike! I think I must have been very very good this year, plus checking in with the big guy for the first time in 20 years probably helped (I sat on Santa's lap this year). Much to my delight and surprise Santa brought me a bike for Christmas! Well actually Dale and Becky picked it out...but didn't they do a good job? It's a purple Electra 3 speed cruiser with pretty gold "henna" tattoos painted on. I wasn't expecting a bike and didn't even know I wanted one, but we immediately fell in love. I have taken her out for one or two short rides a day since I got her. My head is definitely into it; it is taking my legs and rump a little while to catch up! Me and my bike went out Christmas light looking in the neighborhood a couple of days after Christmas and here is some of what we saw. The bike enjoying the lights....aint she a beaut! Pretty view, pretty bike, Horray! haha! 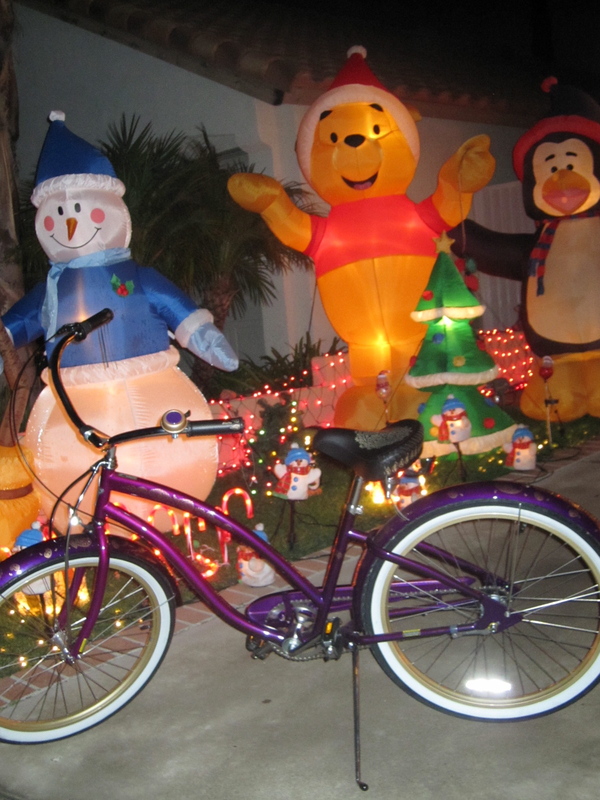 How fun to go Christmas light looking on a bike. 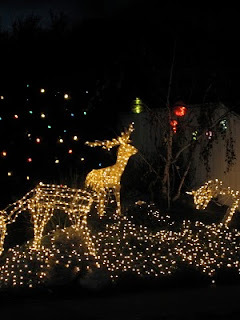 I want to do this next time we are down for the holidays. No Christmas biking here. Ours are all snuggled up in the garage awaiting the big thaw.